Heat oven to 350°F. Using a small melon baller, scoop out insides of mushrooms, leaving at least half shell. (This allows more room for the filling.) Finely chop mushroom stems and centers; set aside. Melt butter over medium heat in large skillet. Add onion and garlic; cook 1 minute. 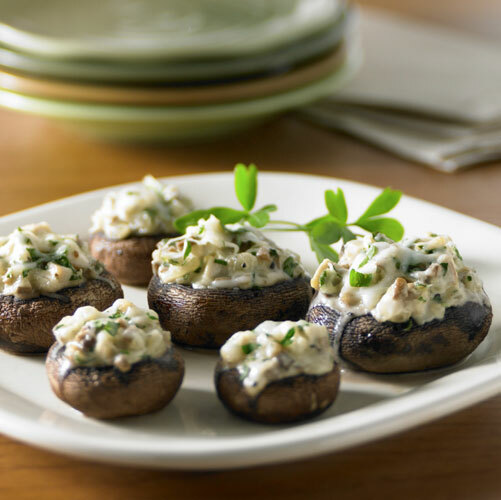 Stir in chicken, chopped mushrooms, Diamond Crystal® kosher salt and pepper. Cook and stir 3 minutes longer. Blend in flour, cream and 3 tablespoons parsley. Cook and stir until bubbly and thickened. Remove from heat. Spoon mixture evenly into mushroom caps. Place in shallow baking dish. Bake at 350°F for 10 minutes. Top with remaining 2 tablespoons parsley and garnish with Mozzarella or Parmesan cheese if desired. Bake 5 to 10 minutes longer or until hot and cheese melts. Garnish with additional parsley, if desired. * Chicken can be left over, microwaved or steamed specifically for recipe. To microwave: place chicken and 3 tablespoons water in shallow baking dish. Cover and microwave at 70 percent power 10 to 12 minutes or until center is no longer pink. Cool slightly.